You are here: Home / blog / News / What is a Charrette? In early August we are holding a Planning Charrette. And you might ask what is that? Yes it is a type of workshop – but it is the second phrase “Charrette” that creates most query. Below is a definition trace – and starting as a french noun – it has been adapted from a student, group finishing process of a project. So essentially a collective swat as everyone is bundled in a small cart heading to a finish!! Original meaning – small cart. Adapted meaning – A collection of ideas. 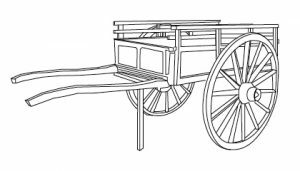 During the 19th century, students of l’Ecole des Beaux Arts in Paris would ride in the cart sent to retrieve their final art and architecture projects. While en route to the school in the cart, students frantically worked together to complete or improve these projects. The meaning of the word has evolved to imply a collection of ideas or a session of intense brainstorming.